Courageous when it comes to trying different restaurants in Michigan, nothing brings me more satisfaction than exploring places with unique concepts. This Saturday by recommendation, I ended up at Johnny Noodle King. Known for their authentic flair of specialty noodle dishes the time had come for me to pay a “Taste Test” visit. Starting off with a cup of green tea with lemon and honey, I scrolled the menu up and down attempting to make my mind up. Finally, my decision was made, and I selected Bowl PHO GA-11. 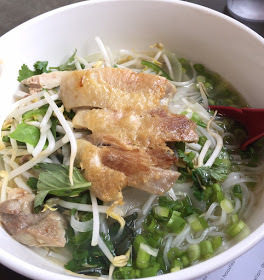 Made with Rice Noodles consisting of scallions, bean sprouts, cilantro, basil leaf, and Jalapeño, it was topped off with a chicken thigh served in a bowl large enough for two individuals to share. Stirring the broth around with my spoon before tasting, the blend of herbs combined smelled fantastic, however, in my opinion, lacked flavor. My chicken was bland, and my noodles were too soft. Although I was disappointed with my food choice, I was highly impressed with their customer service. Do I do plan to give Johnny Noodle King another chance? Absolutely. Will I ever order PHO GA -11? Most likely not.